Corn snakes (Pantherophis guttatus) are narrow-bodied and mid-sized reptiles that come from Mexico and the United States. They are common as pet snakes, but also are often seen as free-roaming creatures, whether in grasslands and forests or farms and neglected man-made structures. Male and female individuals of the species have some differing physical characteristics. 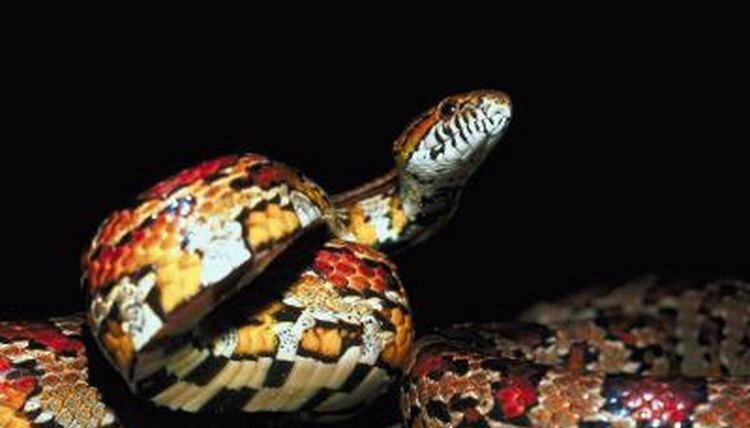 Corn snakes tend to have gray, brown, yellowish-brown, reddish-brown or orange physiques. Their upper portions are covered with sizable red and black markings, and their lower portions are adorned with alternating white and black squares. They are highly clandestine in nature, and are often, but not always, underground. Corn snakes do not produce venom and usually have meek, easy dispositions. They are meat eaters that do not need to eat on a daily basis -- think a couple times a week or so. Their diet consists of a lot of bats, birds and small mammals, including moles and rodents. Lizards make up a big portion of their juvenile diets. They kill their prey animals via constriction. Since they adore eating mice and rats so much, they are often considered by humans to be handy for keeping numbers of rodents in check. One easy way to tell the difference between male and female corn snakes is by considering size. Individuals of the species generally grow to anywhere between 27.5 and 47 inches long, although the males are typically noticeably bigger than the females. Male corn snakes that are on the bigger side often have subtle dark streaks that travel down the length of their bodies -- four in total. These streaks do not generally appear in the smaller males of the species, however. Physical differences aren't the only ones that exist between male and female corn snakes. Unlike the females, the males frequently battle it out with each other on the quest for higher social status. The winner earns a much-coveted "prize" -- the opportunity to breed with the female in the spotlight. Male and female corn snakes are not involved at all in the rearing off their wee offspring. The males say goodbye to the females as soon as actual mating is done. After the females deposit their eggs, their mothering duties are finito, as well. They generally only reproduce once each year, from March into May.